There's never a line for the ladies' restroom in Davos. Men, on the other hand, often have to wait. Women make up just 21% of attendees at the World Economic Forum, an annual gathering of elite politicians, central bankers and financiers in Davos, Switzerland. Most of the panels at the summit are also dominated by men. The stark gender imbalance has been a major topic of discussion at the 2018 edition of the exclusive forum, a reckoning fueled by the #MeToo movement and widespread revelations of harassment by powerful men in media, entertainment, government and finance. Organizers acknowledge that the number of women in attendance is "not by any means representing grounds for celebration." But they say that the share of women is at its highest level since the conference was founded in 1971, and roughly double where it was in 2001. "I'm surprised that in the era when we are talking about cryptocurrency and blockchain and self driving cars, we're still talking about equality between men and women," said Iliyana Tsanova, deputy managing director of the European Fund for Strategic Investments. She suggested the forum adopt a new approach: No women, no panel. "It's very shortsighted not to give women more opportunities to participate," she said. "Some of the best speeches and contributions I have heard here were made by women." Organizers said there were only two all-male panels this year. Zoë Baird, president of the Markle Foundation, said there were noticeably fewer women when she first came to Davos 17 years ago. But she said that organizers could do much more to correct the gender imbalance. "There is no particular explanation in my mind for why the percentage of women here is so low, because there are women showing great leadership in every sector and every business," she said. Baird said that women stick together in Davos, seeking each other out and trying to "give the floor to each other." But when she spoke to representatives from consumer brands on Wednesday, only one of the roughly 50 chief executives in the room was a woman. Tsanova agreed: "I think we all feel the pressure, and see that we are underrepresented. We realize we need to support each other because we understand each other." WEF named seven women to an exclusively female panel of co-chairs for this year's meeting. But there's only one woman on the group's managing board, and women form less than a third of its executive committee. WEF regularly publishes reports on the gender pay gap, and promotes discussion about how to close it. 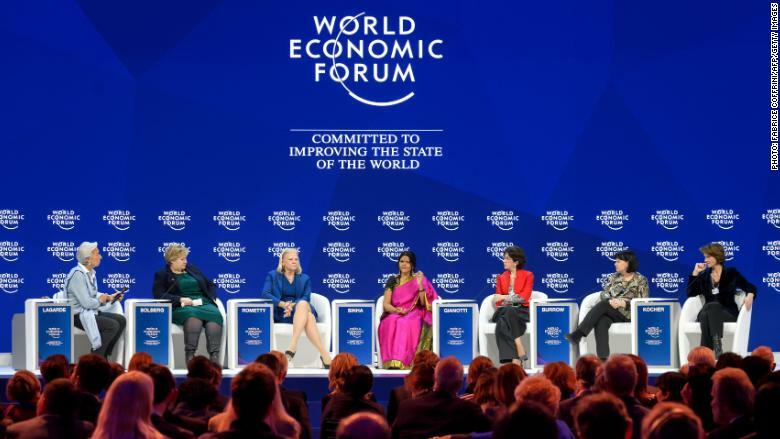 All-female panels are a very rare sight in Davos. One man pushing for change in Davos was Canadian Prime Minister Justin Trudeau, who delivered a staunchly feminist speech and later participated in a discussion devoted to education and empowerment. Trudeau was the only man on the panel, and few joined him in the audience. "I'd like to specifically thank all the men who are here today," he said. "Could you tell your friends who didn't come to this one that this is an important topic and that we all have to have a role in this?" Trisha de Borchgrave, a painter who attended the prime minister's speech, said his message gave her goosebumps. "I think this was the first time in my lifetime, and I am somebody who is in her fifties, that I've heard a world leader taking the initiative and showing the commitment to gender equality," she said. "He's walking the walk, he is making it happen." Another notable panel on Tuesday featured all seven women co-chairs. 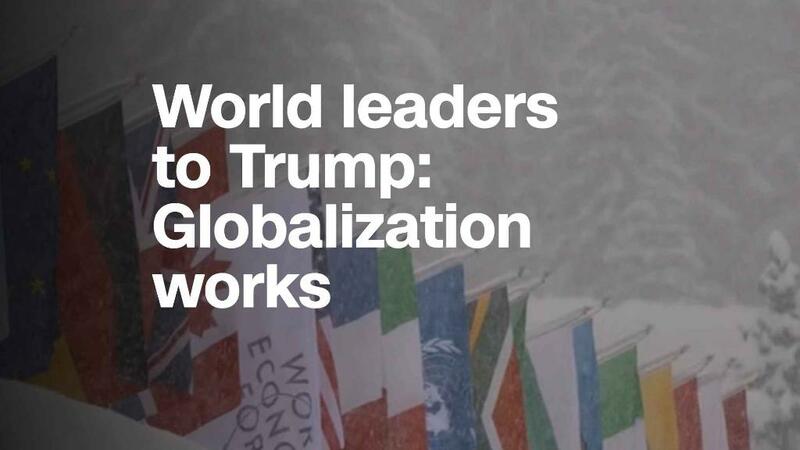 "Not your usual Davos manel," quipped International Monetary Fund Managing Director Christine Lagarde.